WINNIE, DAD SAYS IF YOU DON'T PROTEST ON FACEBOOK, YOU'RE A NAZI SYMPATHIZER. GOSH, CHRISTOPHER ROBIN. I THOUGHT SOCIAL MEDIA WAS FOR PICTURES OF FOOD AND PETS. OWL SAYS IT LACKS NUANCE. 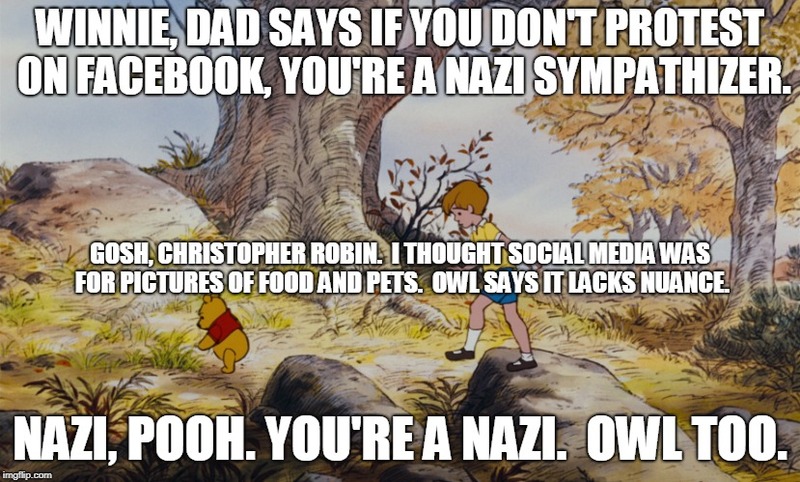 NAZI, POOH. YOU'RE A NAZI. OWL TOO.